Home » Times Says "Give Amtrak a Fighting Chance"
Times Says "Give Amtrak a Fighting Chance"
Submitted by keenan on Mon, 2008-07-14 10:37. It started out as a real victory for passenger rail: the House and the Senate voted to give significantly more money to Amtrak to improve service and upgrade tired cars, tracks and other equipment. But, as is so often the case in Washington, there was a catch. To get a big enough vote to override a threatened veto by President Bush, the House leadership obliged the worst instincts of Republicans. 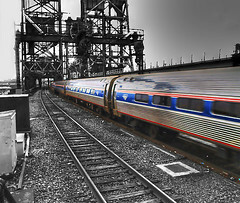 It included a measure requiring the government to seek proposals from private companies to construct a high-speed rail service between New York and Washington. Conferees from the two chambers should throw that privatization provision out as they reconcile the bills. Amtrak deserves this chance, without dilution, after years of being shamefully shortchanged. Its current funding is a woefully inadequate $1.2 billion. The bills would roughly double that, and sustain it for five years. That would allow long-term planning, instead of Amtrak’s yearly fight for life. Diverting money to a pointless experiment in privatization (the cost of land alone to build a parallel set of tracks would be prohibitive) is counterproductive. It would all but ensure that Amtrak remained inefficient and ill equipped to meet increasing demands for service. Its intercity routes this year may carry as many as 27 million passengers, 2 million more than last year. Apart from that misguided addition, the bills are good over all. The two bills — whose primary sponsors were Senator Frank Lautenberg of New Jersey and Representative James Oberstar of Minnesota, both Democrats — require more accountability from Amtrak, and the states. To get states to determine and address local needs, the bills wisely include incentives, like 80 cents in federal money to match every 20 a state spends on rail. Where passenger rail works best, as it does in Europe, it is treated like the critical service it is and is publicly financed, like the highways. Lawmakers can no longer get away with shortchanging passenger rail. Rising gas prices and dependency on foreign oil are front and center in Americans’ minds, as are pollutants that contribute to climate change and respiratory illnesses. Airlines are responding to rising fuel prices by paring schedules, raising fares and charging for checked baggage. It’s no wonder that May was a record month for Amtrak.